The Classic English Kitchen range gives you a truly bespoke kitchen made at any size and with any finish. Inspired by period Georgian and farmhouse kitchens, bespoke kitchens by deVOL continue a tradition of English carpentry made to the highest quality and without compromise. The Classic English Kitchen is our bespoke kitchen range of traditional Georgian kitchen furniture, handmade in the same way for nearly 29 years and inspired by traditional country kitchen designs which have stood the test of time. Everything is made to measure in our Leicestershire workshops, with kitchen designers on hand to help you choose from an extensive selection of sink cabinets, islands, pantries, butchers blocks, dressers, servers and pot cupboards, all custom made to fit your exacting personal needs and room specifications, with carefully chosen accessories and finishes for a truly bespoke kitchen. We pride ourselves on attention to detail and listening to you, our customer. Whether you want to add a new focal feature, fitted or unfitted kitchen, boot room, utility room or dining area, we will discuss all of the options, so that you can make informed decisions. We can also give advice with consideration to our own design ethos or put together a completely personalised colour palette and materials for your Classic Kitchen. All of this helps to achieve something truly inspiring; beautiful spaces containing the finest quality furniture that will last for hundreds of years to come. All cabinets and worktops in our bespoke kitchens are handmade by experienced cabinet-makers in our Leicestershire workshops. Quality hardwood throughout and broad planked fascias assure strength and longevity. Solid Oak dovetailed drawers give unrivalled drawer fit. Our Classic Kitchen furniture is made predominantly with hardwood from accredited sustainable sources. We use tulipwood, a strong American hardwood, for the doors, fascias, cabinets and shelves of our Classic furniture. Our bespoke cabinet doors are mortise and tenon jointed and hand planed to fit by skilled cabinet makers with many years of experience. While it is possible to fit doors with machine tools alone we feel that the investment in skilled cabinet makers is worthwhile, ensuring a level of fit that cannot be achieved by any other means. 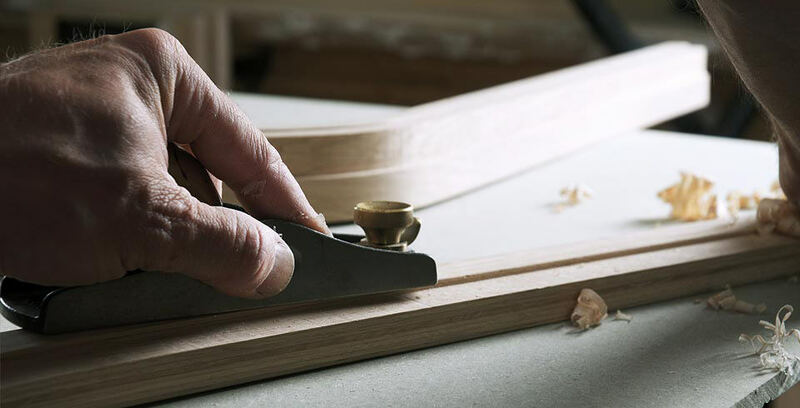 The tulipwood for our bespoke cabinets is carefully selected from planed stock and seamlessly glued together to create wide stable panels that you can be certain will not have any knots to bleed through the paintwork. Wide tulipwood backboards are variable width and feature a traditional Georgian furniture bead. As well as being a pleasing detail, interlocking hardwood backboards facilitate natural movement so that natural expansion and contraction inherent in timber does not cause problems over the long lifespan of your bespoke kitchen.